Packed full of advanced multimedia features through the VIA CX700M2 system media processor, the all-in-one digital media IGP chipset integrating the VIA UniChrome Pro II 2D/3D graphics core and an extensive array of high end audio and video technologies, including Vinyl Multi-channel HD audio, hardware MPEG-2 and WMV9 video decoding acceleration, and a built-in HDTV encoder up to 1080i for HD DVD playback for the richest entertainment experience. 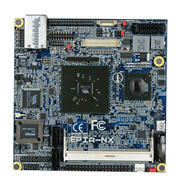 Measuring just 12cm x 12cm, the powerful, feature-rich yet highly power efficient VIA EPIA NX Nano-ITX embedded board supports the 400MHz VIA V4 bus and integrates the VIA PadLock Security Engine, and with all the performance for today's digital media technologies and with an I/O targeted at the consumer electronics market. The VIA EPIA NX Nano-ITX mainboard features two Serial ATA connectors for faster storage access, an Ethernet port for seamless broadband connectivity with the optional upgrade of Gigabit Ethernet, and supports up to 1GB of DDR2 400/533MHz SO-DIMM memory. Or manufacturing option for VIA VT 6122 Gigabit Ethernet controller.